Blue and White Lovers Club and a porcelain giveaway! I pick a subject every time I have a “virtual meeting” of our blue and white club and today is all about using ginger jars. Truth be told, I never met a ginger jar I didn’t just love! Super versatile, always beautiful, whether alone or a pair, or even as a grouping for that matter. Lordy knows I love them as they are all over my home, I generally like them as a pair or in a grouping/vignette. Also so love them outside as you will see below and they make fabulous vessels for floral arrangements as well. So lets take a look at ginger jars of all shapes and sizes in action. And just in case, you get a little of ginger jar fever, all porcelains are 20% today only! And here we go…..
A simply elegant and classic arrangement in my living room, love a cluster of jars of different sizes and shapes with a focal piece as the center, in this case a beautiful orchid. Took this picture from the Maison Objet show in Paris about 6 years ago…..what’s not to love! 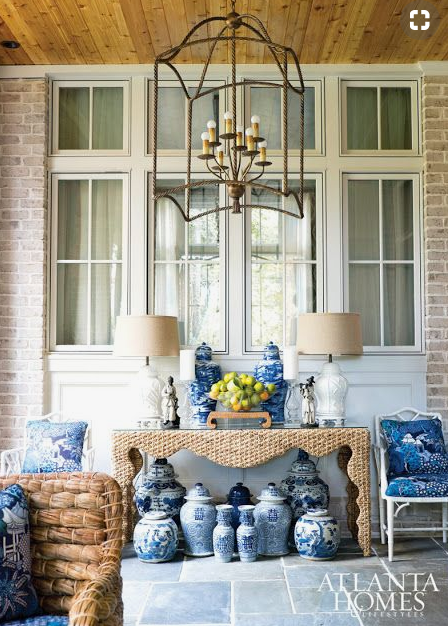 This is so pretty, just love the entire vignette and mix of pieces with ginger jars, plates and vases, fabulous! Seeing a big cluster of porcelain ginger jars is a favorite look, proof you cannot have too many! This is a customers photo and I LOVE how she filled my chunky dragon ginger jar with this explosion of hydrangeas, fabulous! This post makes me want to go do some serious tweaking/rearranging! How do you like to use ginger jars? Solo, pairs, filled with flowers? There are so many ways to enjoy and use ginger jars…. If you have some ideas of what to discuss or a subject you would like to know more about for our next meeting, I am all ears. Leave it in the comment section. Until next time……. 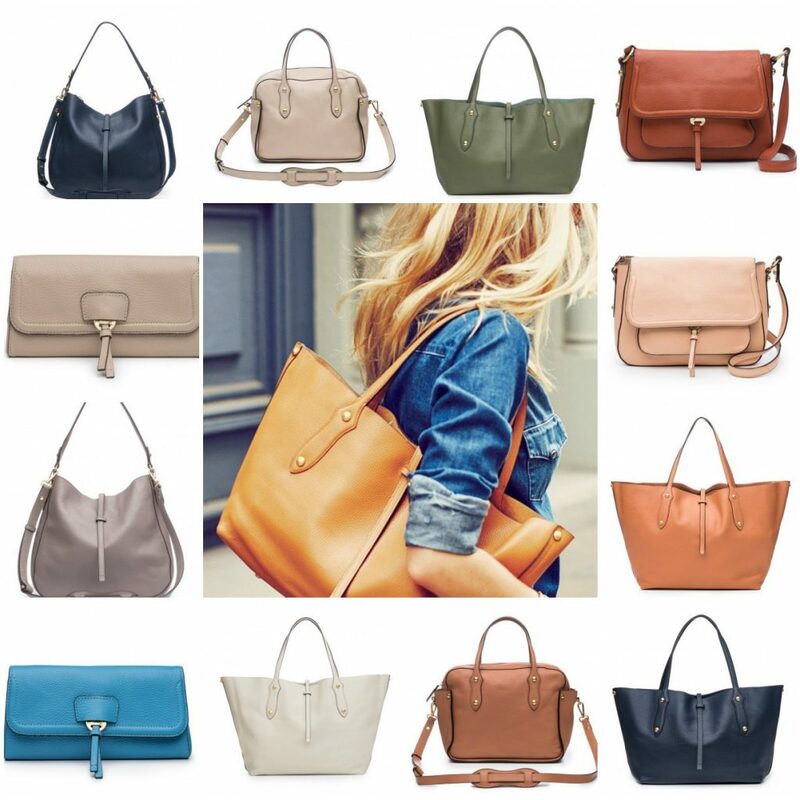 PS As of Friday morning our spring Annabel Ingall bag sale is on, SO many fabulous new bags that you must see, click here to see. One lucky winner will win this pretty flat top jar, ideal for so many places, half the fun is playing around with it and trying it in differnt places! Leave a comment on this post to be in the running and I will announce a winner on Sunday! You have given validation to my thoughts on ginger jars; you can never have too many! It’s so fun seeing all the different painted styles on the ginger jars….and even the different shapes. No two alike. I love the ginger jars filled with tall cherry blossoms. It doesn’t get any better than that. Love all the ginger jar pictures! So inspiring. Nothing more beautiful than blue and white ginger jars filled with flowers! Fresh flowers in a ginger jar always looks so beautiful on my large kitchen island! 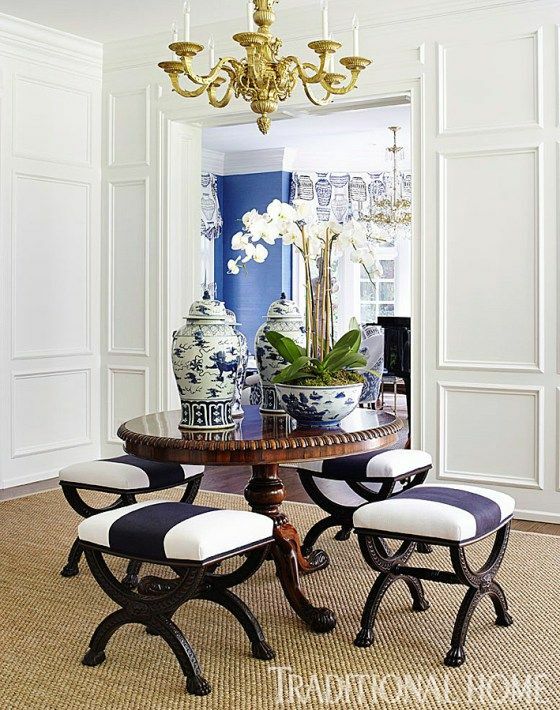 The cool thing about blue and white is that it seems to cross over various decorating styles! It can also be changed, rearranged, moved from room to room to add variety, used in every season, indoors and out. It’s hard to think of something else that a person can have so much fun with in decorating! Thanks for this post! Blue & White Love for many years! Charming Ginger Jar ~ Love your Style! As a beginner collector, I love all the blue and white inspiration I find here and on your Insta account. My eyes automatically seek out blue and white on my antiquing ventures. Thank you! I love ginger jars to fill the space on top of chests and secretaries! An early morning treat on a rainy day…the pictures are beautiful. Never too many ginger jars! Every beautiful photo made me feel happy. Thank you for sharing ! Love ginger jars! Can’t get enough! I think you singlehandedly brought blue and white back!! Love my ginger jars Best on our outdoor patio! Look forward everyday to reading your blog. My collection of blue and white has doubled since I found your site. Thank you (I think). Loved that pillow in your chair with the needlepoint Ginger Jar & fringe! Is that available? Blue and white is always a good idea! Great inspirational post! Blue and white ginger jars have played a role in my decorating throughout the years and through a number of different homes. Somehow they always seem to “fit”. Timeless! 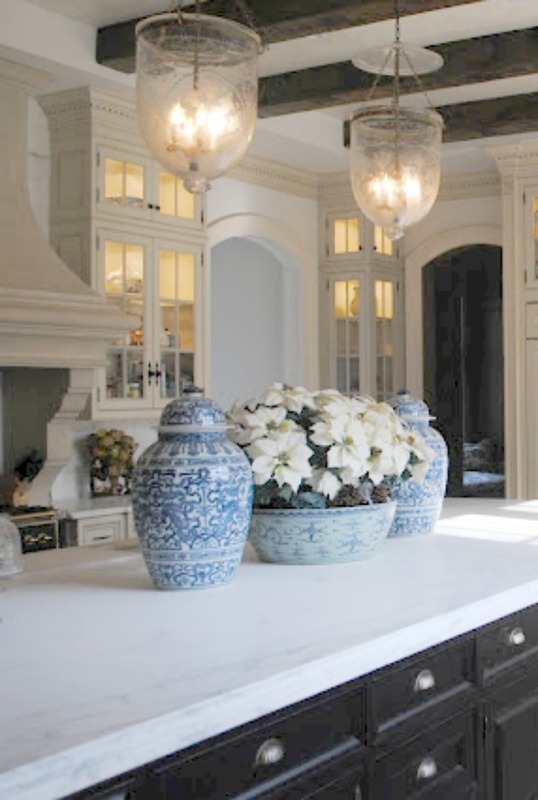 Absolutely love blue and white ginger jars – inside and outside! Love all of the great ideas! Now I need more so I can put some outside! All beautiful explosion of ginger jars to fancy! This post makes me want to change up my decor for Springtime. Truly inspirational. There can never be enough blue and white! I use the small ginger jar by the front door for keys. It hides the clutter and I always know where my keys are. I bought my first blue and white ginger jar over 30 years ago at an estate sale, and have never looked back! Lovely and classic ! That says it all …. more is more with these beauties! I love every setting in this post!!! 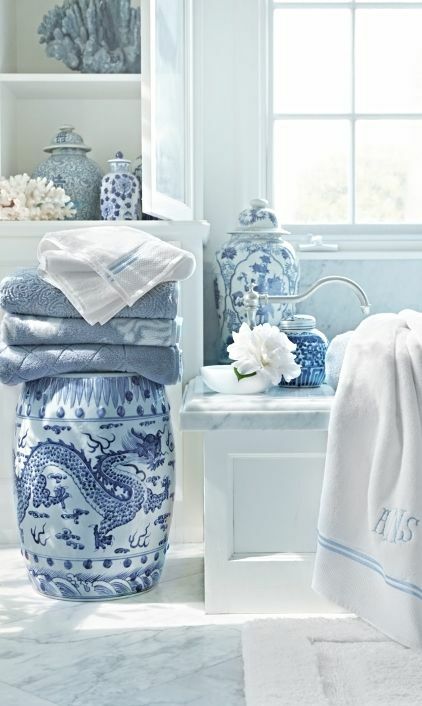 A young college girl came to my house and when she saw all the blue and white porcelain she exclaimed, “ have you been to China?” I haven’t but would love to go. My granddaughter is going there this month as an exchange student, I told her to take an extra suitcase and fill it with blue and white! Thank you so much for your inspiration in decorating with blue and white. I can always use another ginger jar! I can’t get enough of jars! And thanks to TEH, I have quite the collection, but always looking to add. Love them on the dining table, have them scattered on the floor next to bookcases, under sofa tables, etc. Tina, you have the best collection EVER! Beautiful pictures, as usual! I like the photo of Kelly Nan’s because she hints at her seasonal arrangement by not only the flower types but also the gourds that are strategically placed. Your hallway console looks amazing. Idea: why not explore the origin/use of specific blue and white vessels? Thank you for sharing this eye candy! I am trying to figure out a place where I could use ginger jars (blue and white), and you pretty much proved to me that they can be used anywhere! Love how you put things together. I have collected blue and white dishes, ginger jars and vases since I graduated Law School 25 years ago. Cannot get enough. We just redid our house and every room is blue and white! I will never get tired of blue and white. Thank you for validating my choices! As a lifelong collector, I always enjoy your posts. Thanks Tina for spreading the appreciation. So many beautiful rooms full of blue and white! I use a ginger jar on each bathroom sink filled with cotton balls. No one knows I use those cotton balls every day at every sink for a medical condition. They not only look pretty but fill a need. Thanks for this lovely post. Blue and white pieces catch my eye also, as do blue and white dishes! 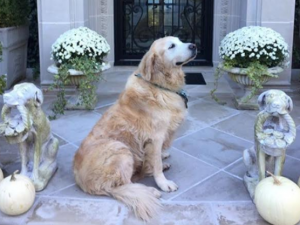 Thanks for sharing your elegant home and styling tips with us. I loved this post on Ginger jars. I find the mantle ideas my favorite. We recently moved and I no longer have the mantle depth to use my blue and white collection there. I have substituted a drop leaf table in my living room to display my small collection. I would be thrilled to add this jar in the giveaway. Thank you. Ginger jars and cherry blossoms does it get any better then that! Love all the pictures and inspirations of blue and white. Now i must start rearranging my collection. Such beautiful blue and white inspirations to brighten the first day of March! The ginger jar is a beautiful highlight for any tabletop setting! Tina, your blue and white porcelains are magnificent!! Hi Tina -Thank you for your inspirations. I am 2 months into our new Colorado ranch (literally a ranch) home, that I drew 3 years ago. Although I have been living the house in my head for 3 years, I am still struggling with the reality of it all. My last home, outside of Hilton Head, SC, was mainly navy blue and white. I would throw a different punch color in the mix as the seasons changed. It was so fun, and kept me from the boring alert…..which always leads to moving and building another house. The ranch house is literally our last house. So, I am trying to figure out the “neutral” color for the main decor, so I can still add the punch colors. My current inspiration is Mark Sikes and his beautiful book BEAUTIFUL. Maybe I will use camel as the neutral. But I MUST have blue in the picture, and also green. And, of course, this house will have the blue and white porcelain jars. I now have 5. Today, I am on the hunt for more for the center of my island. The island is 90″ square. I hope I can pull it off. I have a few of the ginger jars that still look great in my home! Blue and White Ginger Jars have always been my favorite accessory. Also cool, crisp and classic! My house is filled with them.. Happy March! It’s great knowing that spring is almost here and I can walk outside and pick flowering branches and twigs to fill my ginger jars! Magnolias are the best! Good grief – so many gorgeous photos today! Love that last kitchen, and the pieces used in the bathrooms! Ginger jars all over my home- inside and out! Love them massed on my screened in porch, on an antique wicker table. 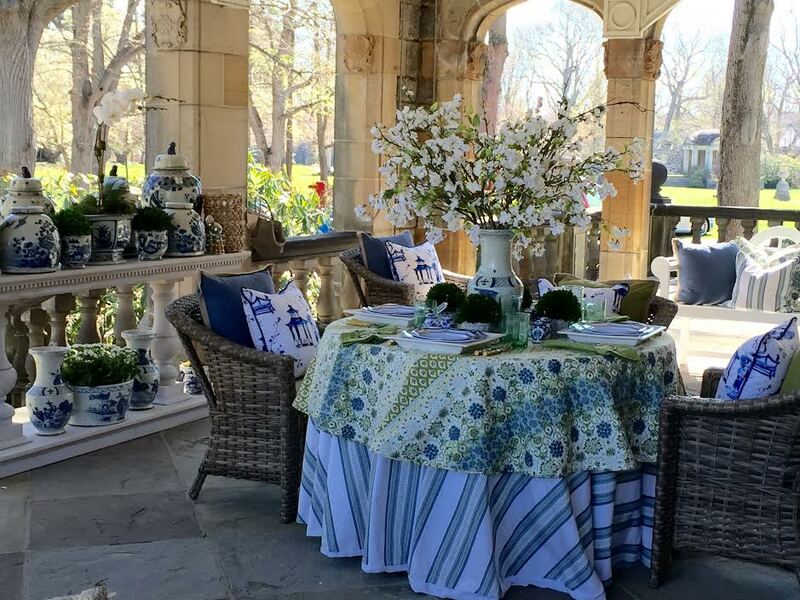 Beautiful porcelains and great ideas for using them outside. Can’t wait till Spring! Love, love, love this post! What fabulous photos! Blue and white is so classic–never goes out of style! Thanks for bringing a little sunshine to start the day! These photos are beautiful and classic! 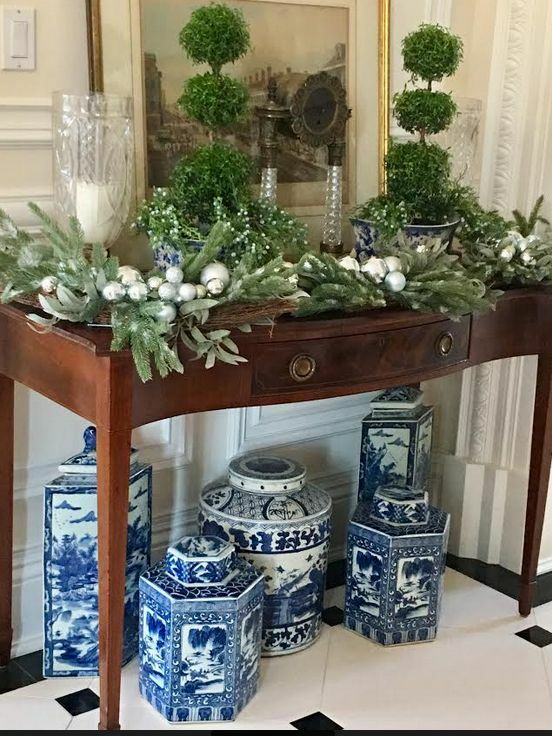 I have been incorporating blue and white in my decor since I first married 45 yrs ago! 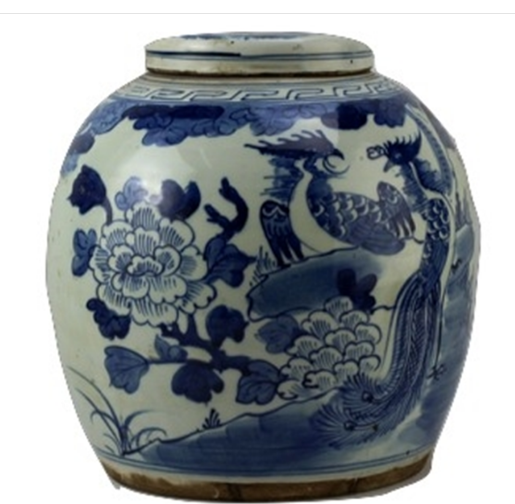 Blue and white porcelain ginger jars are like animal prints and a fine antique accent piece or painting–timeless!! 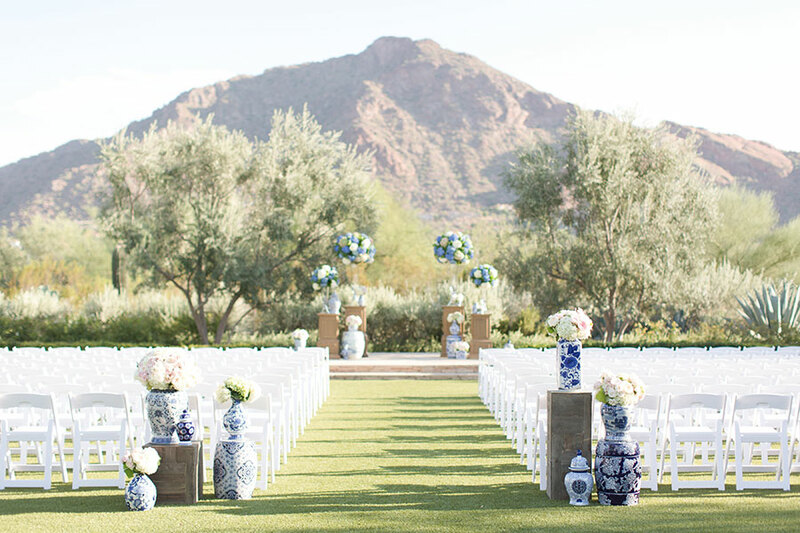 love, love, love the ginger jars and all the beautiful blue and white decor! Have you noticed that every color of flower looks good in blue & white? So it’s beautiful & full proof, a great combination. Love, love, love these posts! I was a blue and while lover before it was fashionable! Loved all the pictures! Especially the one of Teddy….. It is fun seeing all the ways blue and white can be combined. Thank you. Is there anything prettier than blue and white? I think not! My favorite are the white lilies in the ginger jars! Love ginger jars, so much great inspiration! I love the larger ones as a statement piece. Thank you for beautiful, traditional elegance ! This reminds me I need to get some cherry blossoms for my tall blue & white vases! Oh, Please, please pick me! Have coveted this jar. I need more blue and white in my life! Your post today gives me lots of incentive to spring clean and find new places for all of your blue and white! Thanks for the inspiration! I have recently discovered GOLD! I have been collecting a couple of things and combining them together! I have scoured tag sales, auctions, flea markets alike for clear glass ginger jars and they are out there! I then purchase lids from old porcelain ginger jars and combine them! I fill them with kitchen pantry items and drop in a blue willow teacup for a scoop! Ta-LD! I would send a picture but I am moving now….. can’t get enough! I don’t think you can have too many! I use them clustered on a plant shelf and on an armoire in our living room. The more, the merrier! You always inspire me to walk around my home and do some tweaking after I admire your line-up of beautiful photos. The bird jars filled with flowers on your customer’s lovely kitchen island are especially warm and inviting. You certainly know how to lift one’s spirit on a rather gloomy, rainy day. Thank you. Love them all- adds elegance to any room. Happy March first to everyone! This post is perfect for early spring. 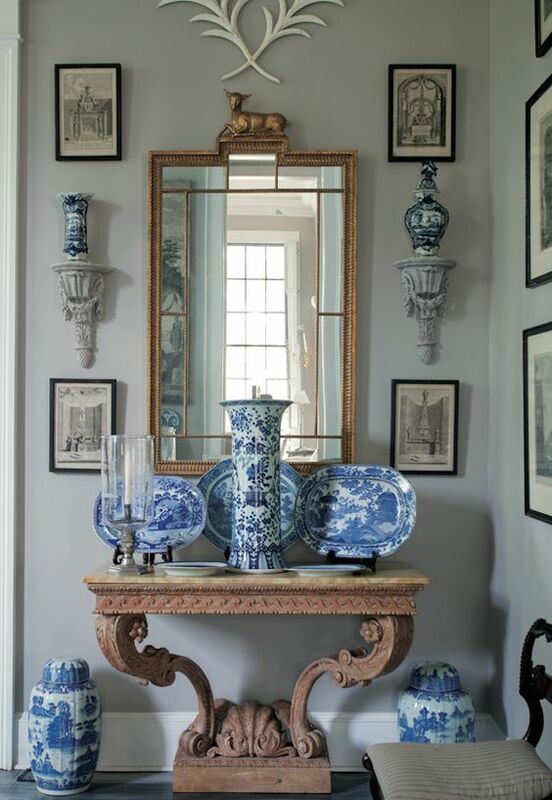 I am truly inspired to rearrange my blue and white yet again…an addiction for about 30 years now! Thanks for giving us “addicts” a place to joyfully gather! I have collected ginger jars over the years to the point that I thought I should stop. You have convinced me one can never have too many! Always enjoy the look of various shaped ginger jars grouped together. And, with fresh flowers, of course! With every new piece of blue and white comes the fun to rearrange them all! 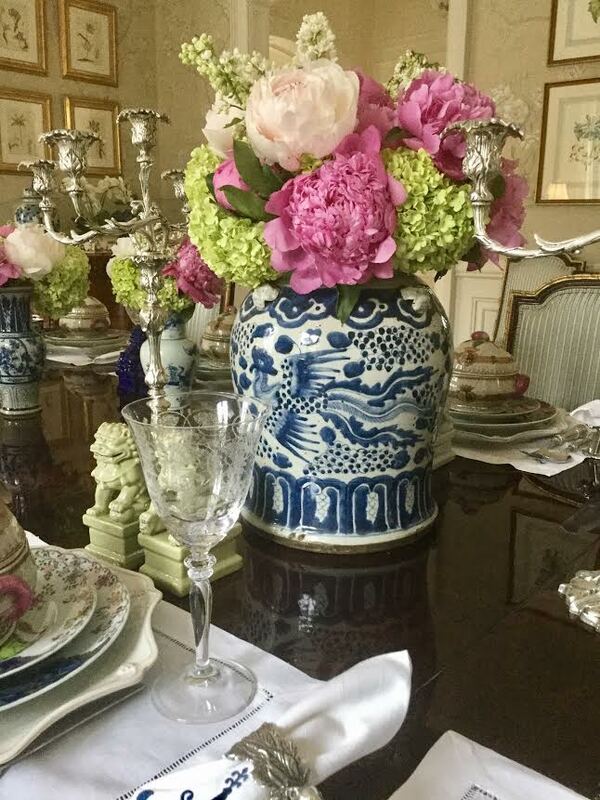 Blue and white with peonies is always a breathtaking mixture. This definitely puts me in the mood to start “playing”! I can’t get enough, Tina! Thank you for creating this amazing Blue and White Club! Flowers in ginger jars … beautiful! And love the needlepoint pillow! Lovely, lovely post. Thanks Tina for all of your inspiration! I have come to love blue and white and have collected many pieces over the last few years. Love all the pictures of different ways to use them. I wish I had more room to collect more. I love Blue and White and have so many compliments on incorporating it all over my house and even my office. 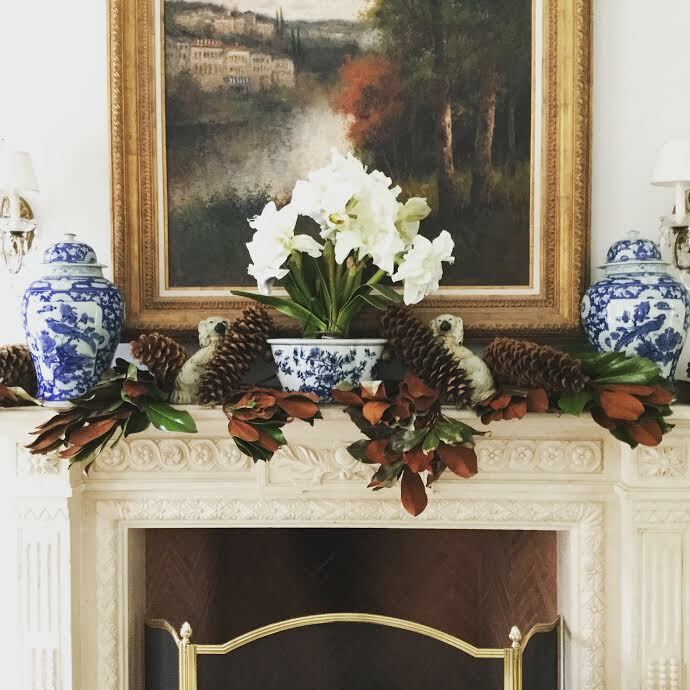 I used two ginger jars on my mantle with hydrangeas..Then placed an antique bamboo shelf in the middle with antique books and small blue and white pieces. You can never have to many ginger jars. Such a classic shape and style! 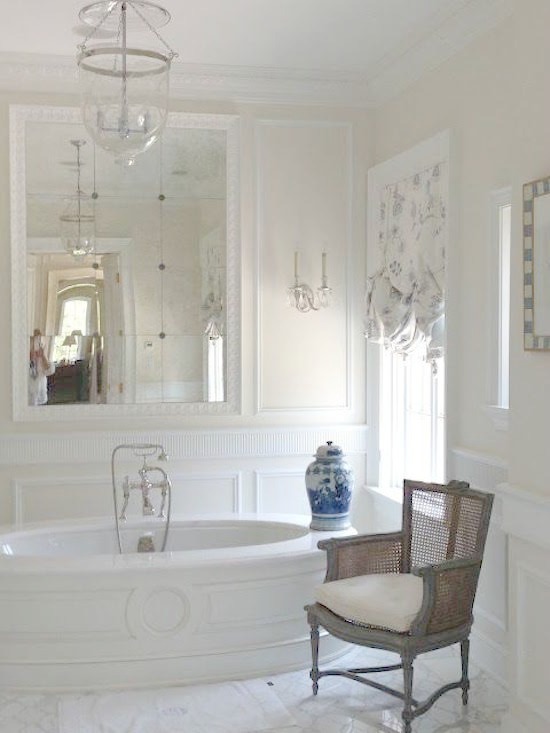 I am so inspired by the beautiful blue and white vignettes. Indoors and out, they are all gorgeous. Wow! Your photos are an inspiration! Everything beautiful — but what really caught my eye was the blue and white ginger jar needlepoint pillow. Redoing my living room and have been looking for another 18″ pillow to add to the couch which will work with a blue and white Katha Diddle pillow. Let me know. Many thanks …. I am a believer. Every room looks better with blue and white. Love all these ideas! I use my big TEH jars (19″) everywhere, the floor, the hearth, on the dining table or an antique chest with our without greenery. Really a versatile piece. Thanks for the blue & white inspiration! wow! Never too much blue and white!! Ginger jars are a favorite! Thanks for sharing all the lovely pictures! Love your blog, after 4 years of reading every post. Thanks for your inspiration! And thanks for the sale. Wow! Love your post. Check it every morning. 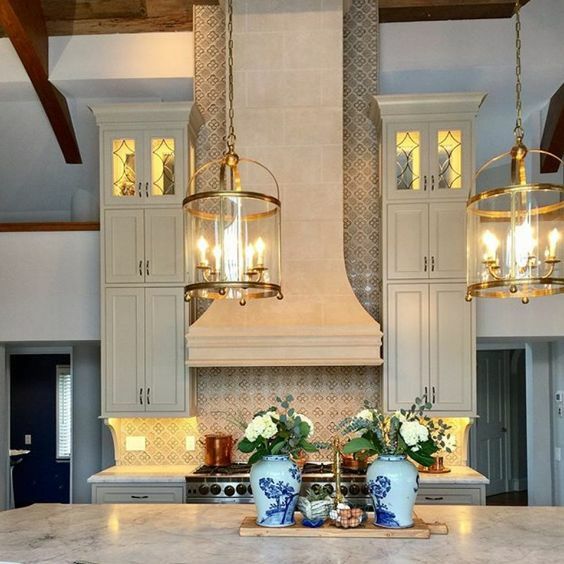 I think that blue and white in the kitchen and bathroom is just fabulous!!! Ginger jars and garden seats rule! I am redoing my family room around my blue and white porcelains. I ordered your new style tulipieres and cant wait to put them up with Tulips. As a designer I am so excited to see beautiful color and florals back on the scene- they are just fabulous with the blue and white. I would love to win the flat top ginger jar! Thank you for another inspiring post, , , such beautiful photos. Blue and White never goes out of style….kind of like classic clothing you never get rid of. What is great is a “merchandising” trick…..move around and fill in differently and one feels like they have a new look without spending $$$$!!! 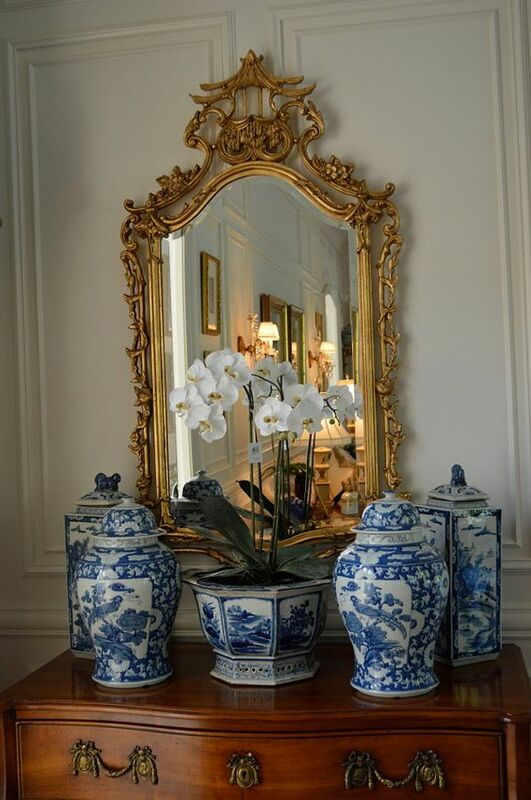 Always so many beautiful photos and of course your blue and white porcelain! Each photo is amazingly beautiful and proves that blue and white and ginger jars can be used anywhere. Thanks for sharing such charming arrangements. I love ginger jars in all shapes and sizes, especially dressing up a mantle! I am a life-long member of the blue and white club! I have been collecting blue & white for 35 years. I never grow tired of the look! So much fun… you are so inspiring! Thank you! Ginger jars are also one of my favorites and I really never thought of putting flowers in them until I saw your posts. I hyperventilate looking at your beautiful collection of blue and white porcelain. 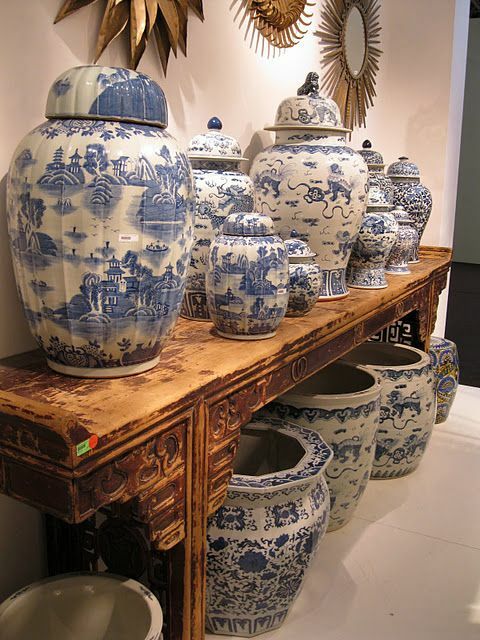 Cannot get enough of blue and white porcelain, especially ginger jars. House and outside too. Too many is never enough! So many beautiful ways to enjoy & love blue & white! The flat top jar is lovely & very versatile. The pictures you posted today inspired me to start changing things around for Spring. Beautiful pictures! Blue and white ginger jars look so bright, clean and fresh, even in the cold and rainy winter. I really enjoyed this blog, showing the many uses of blue and white porcelain. I like the hydrangeas with the sunflowers. The arrangement is so bright and cheerful! 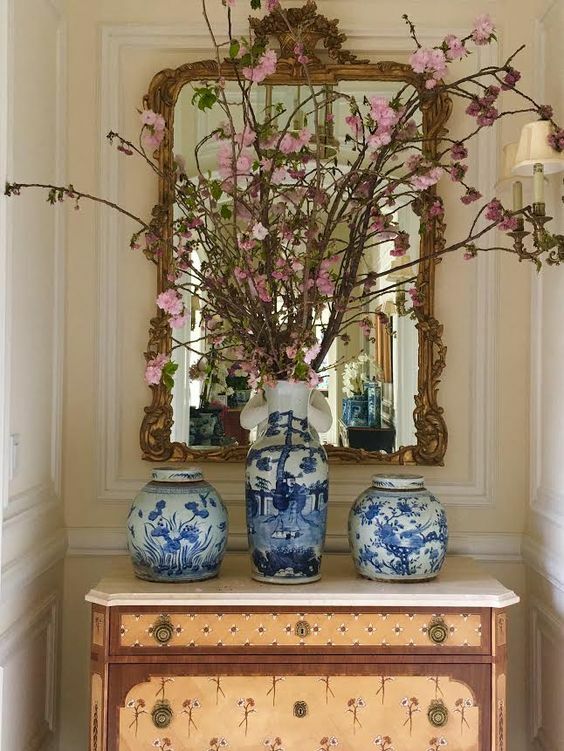 I have a blue and white porcelain bowl, on an Oriental wood stand, with an arrangement of blue and white hydrangeas on my living room table. But, now I want to get some bright, yellow sunflowers to give it a new look. I also have two, tall ginger jars on my kitchen island and have tall grasses with white flowers at the end of the stems in them. I love the arrangement. Simple but classic. Blue and white is always good!!! Fabulous and inspiring pics…as always, thanks for sharing blue and white beauty! My favorite post ever!!!! Oh my gosh, I’m just giggly with all the gorgeous vignettes. Love the blue and white club. Thank you Tina!!! My first purchase from you was a large bird ginger jar. I can take that jar and place it in any room in my house and it always looks beautiful! I was always a green girl but because of your posts I’m in love with blue and white!!! Blue and white never goes out of style. Love it! I just received a new ginger jar yesterday and can’t wait to play this weekend. Thanks for all the inspiration! I grew up surrounded by beautiful blue and white as my mother was an avid collector of antique blue and white procelain. She was such an expert that she taught a class on Asian artifacts to 7th graders at our local Assistance League. I learned from her, just like I am learning from you, how it can fit in really anywhere in the home. I have a few pieces myself now and particularly love using blue and white ginger jars outside on my garden table filled with flowers. Wandering through the photos on your post, Tina, is like being immersed in blue, white, and flowers. Can’t get enough of them. Thanks for my Thursday gift! You’re always an inspiration for decorating ideas. I feel I can never have enough blue and white china! Thank you. Oh my goodness…..so many amazing inspirational pictures!! I love them all! Perfect timing for March 1st! What an inspiration!! With March appearing on the calendar, it’s time to rearrange the accessories and welcome spring. Thanks for sharing so many fun ideas. Blue and white ginger jars: the perfect, seasonless accessory! Love this flat topped ginger jar and I can think of a million ways to use it and places to put it! I do not own any Ginger Jars, but I sure do love them! What wonderfully inspirational pictures you have shown us today. Love everything blue and white. So many great ideas in today’s post. You can never have enough blue and white. The ginger jar is a must have. Love seeing beautiful pictures of blue and white ginger jars! They are so versatile. I use mine for every season. Thank you for all the ideas with the jars! This is one of the most beautiful posts. That is saying a lot for anyone that follows you. Truly it took my breath away. Thank you so much for being my happy place. Not much happy in my life right now, and this is such a positive happy place. Thank you! Beautiful pictures today..and nicely reflects ways to use porcelains, some unexpected too. Love the bridal table..your travels..wedding photo..mantle grouping..and with the white coral..
Beautiful photos. Always a pleasure. So many gorgeous and inspiring pictures. I can’t wait for spring to come so that I can fill my ginger jars to the brim with numerous shades of pink peonies! Love the new blue and white club feature!!! Ginger jars are such a great accent- enjoy all the pictures. I am so trilled to meet a kindred blue and white spirit. I have loved blue and white since I was a small girl, always redecorating my room. Now, my pretty white farmhouse boasts a lot of blue and white, but I need more!!! I would love to win this beautiful jar. It is perfection! 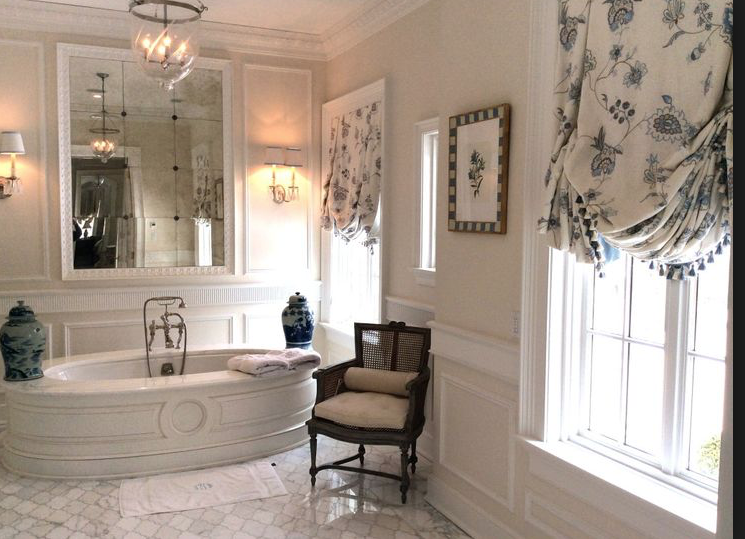 Blue and white porcelain is a standout in most any decor. Love my blue and white porcelain!! Adding more pieces would be wonderful!! 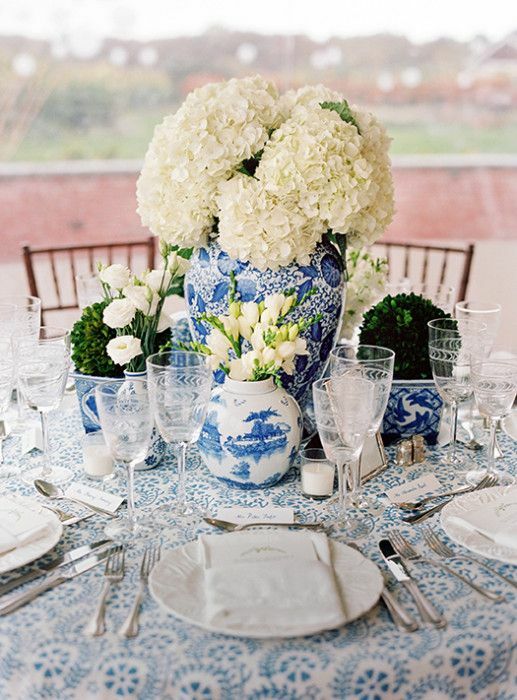 Absolutely adore all the blue and white particularly with spring blooms! Just gorgeous!!! I love extra large Ginger jars flanking a fireplace on the hearth. I really want a pair of the 3 ft tall jars and I hope one day your store will carry them…. I use my jars of all sizes on my bookshelves and on the counters in my kitchen…. they hold mail, coupons and all the charges used…phones, tablets, etc. They are beautiful and practical!! Loved all of the photos! How can anyone have too much blue and white or too many ginger jars? Never! How can anyone have too much blue and white or too many ginger jars? Never! Love, love, love all your gorgeous examples! Thank you for the inspiration, I am in love with blue and white jars! Blue & white inspiration !! The pictures are absoutely gorgeous and full of so many ideas to use ginger jars. Thanks for sharing. 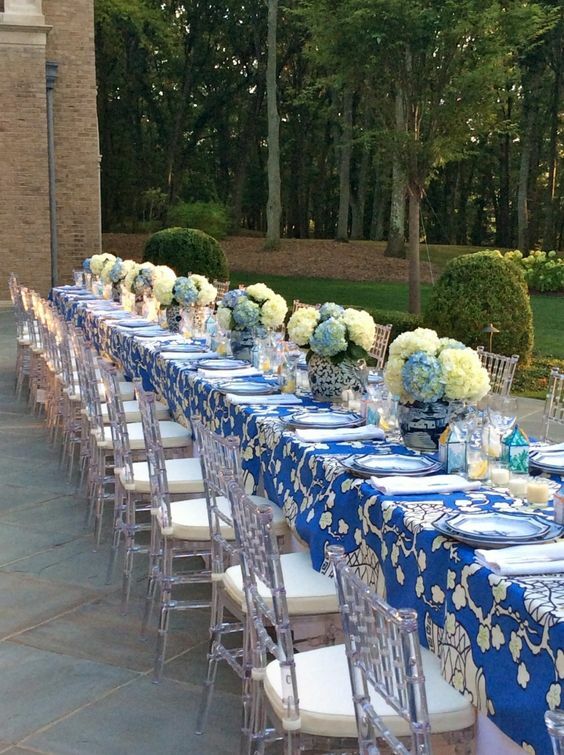 Love all the blue and white inspiration! I’m getting closer to adding a few pieces. I must be patient. I keep meaning to mention to you that the Skin So Soft products by Avon do a great job repeling the noseeum flies in SC. I just apply the oil at the end of my shower and then lightly rinse it off. Some keep it in a spray bottle mixed with a bit of water, but the shower trick is less greasy. I LOVE YOU and I LOVE your BLOG! I only have one piece of blue and white…But you have converted me! As my interior design taste has evolved over the years I started and have added to my blue and white collection. Sitting here at my laptop I can now count 10 beautiful pieces. Love the inspiration your blog provides! I’m with you on ginger jars! I really hope my name is pulled for this one! Thanks for sharing all of the beautiful pictures! I especially loved your mantle picture with the 3 ginger jars in the middle! My blue and white collection will forever make me happy! So pretty and classic! This combination works well in all seasons simply by switching out the accent color. I have been a lover of all things blue and white for over 40 years! I cannot get enough of blue and white anything…period. OMG… what a heavenly post, Miss Tina. So beautiful – every pic! Hope you’re not getting the Nor’easter like us. Have a wonderful weekend!! I have always had blue and white whether it be dishes, porcelain bowls, ginger jars, platters, etc. Thank goodness it never goes out of style…always a classic. I have enjoyed your website and always look forward to looking at all the beautiful decorating. Thanks for taking the time to make us all happy and full of joy with your excellent taste! Love all the blue and white. And love the pictures of Teddy. Ginger jars on patios are truly a spectacular addition that many don’t think of using. The display in today’s post is one of the most inspiring I have seen. So beautiful ! Thanks for sharing so many exciting ideas. I love that the blue and white porcelains are old and tried and true but yet new at the same time. Very versatile and go with with so many different decor palettes. 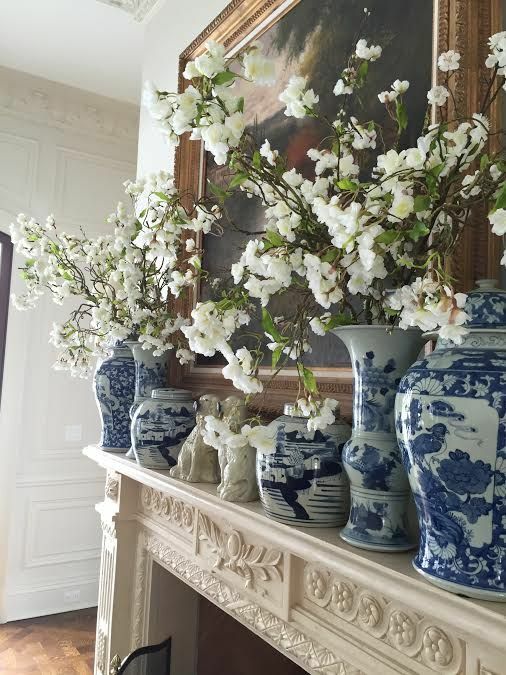 Love blue and white ginger jars almost everywhere, but especially on the living room mantle! I love seeing them outside! Gorgeous, and now I am on board with that too. Thanks for all the fabulous ideas! Each spring I look forward with eager anticipation for my peonies to start blooming. Nothing prettier than ginger jars full of beautiful peonies to place around the house! I agree that you can’t have too many blue and white ginger jars. There are so many shapes and sizes. Good day to add to my collection. Thanks for all the new ways to use them. Blue and white can make a tired room look fresh. Most people are drawn to it whether they have any or just admire it in a setting. It is timeless and classy and doesn’t have to be expensive Love it and love Enchanted Home. Thanks for sharing good style. I have been in the blue and white club since I was in college. One of the first things I bought for my apartment was a blue and white flat top jar that I still have today. Now my daughter is following in my footsteps. Proof it is always fresh and an enduring element of good design. My house is almost finished. Can’t wait to start decorating with blue & white! Love all blue and white…can’t get enough! Never tire of these! There is always room for one more. Your pictures want me to go redo the whole house! 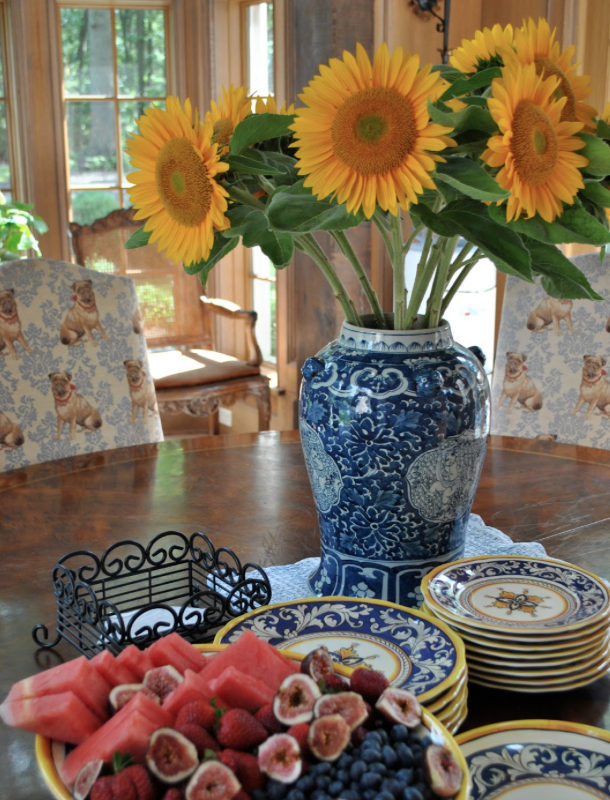 So love blue and white, whether it’s ginger jars or vases or plates. The look is one I never tire of and so versatile throughout the seasons! It all started when we went to the Delt factory in Holland in the 1980’s. One look at all that beautiful blue and white porcelain and I was hooked. Love the ginger jars! They make me happy! That blue and white combination is the spark that enhances the decor in any room in the home. Lovely illustrations, Tina. Thank you! Love that you support the Blue and white ladies! Love the inspiration – told a friend about your blog just yesterday. I know she’s hooked too! Love your beautiful home and beautiful jars! So inspiring! I would love to win my first ginger jar! I love seeing how everyone uses the Jars. Hi, Tina, Thank you for your blog—I find it to be so calming. Such beauty! Thank you for providing not only a resource, but also incredibly inspiring photos for blue and white treasures. 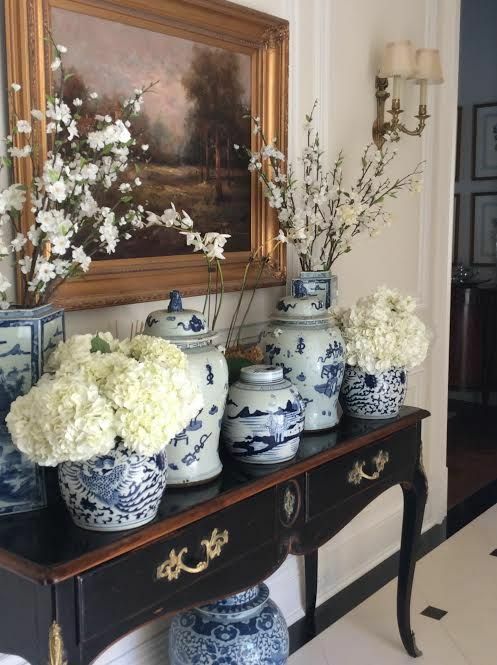 I have collected blue and white porcelain for many years and have never tired of it! Ginger jars are so timeless and elegant. My daughter is getting married in September and I am trying to talk her into blue and white jars filled with her bright colored flowers on the tables. Love this look! Hopefully I can talk her into this look! The beautiful ginger jars and flowers truly inspire me and give me a nudge that Spring is approaching. Love! I feel as though I’ve found my group! Love the blue and white and all your ideas! I love ginger jars, too! You are right, I never saw one I didn’t like either. Love how you incorporated the mini foos on your dining room table! Love the tall ginger jars filled with cherry blossoms! Love a blue ginger jar! So many great ideas on this post. enhanced by the center orchid. I also think the 3jars on your mantel with the peony flowers are lovely. Can’t beat blue and white. Thank you for all the inspiration. Oh my! I smiled at every blue and white picture!!! Thank you for a happy blue and white day as it is dreary and rainy here! Much needed! I just love a ginger jar and never seem to tire of them. I can tell my friends don’t “get it” tho and just think I’ve lost my mind! Keep them coming. I loved all the beautiful photos. Thank you Tina. My home is filled with blue and white, but I could use one more! I love your blog and look forward to reading it every day especially on Sunday. Blue and white is also my favorite. What a fun way to spend part of a gloomy rainy day looking at all these photos of blue and white. So classic! Right now I have a beautiful picture with sunflowers leaning on my mantle with blue and white ginger jars on either side. if I hang the picture like one of your pictures, I can add more, and it would look beautiful. Thanks! you have wonderful taste….love all your ideas! Oh my goodness! So gorgeous! Love blue and white! This piece is beautiful and could be used in so many ways. Beautiful! Hi Tina, I have been following your lovely blog for a few years now & always enjoy your posts. My Mother was a serious blue & white fan and also always loved hydrangeas. I am starting to see the timeless appeal of using blue & white in your decor. My hubby & I are building a new home and very close to moving in. We have chosen lots of greys, crisp whites & some blacks and now looking at roman blind fabrics. The blue & white combinations just seem to pop on our grey walls and will give the rooms a lovely lift of colour. I still have a few of my Mother’s blue & white vases to use, but am wondering if you ship to Australia? Porcelain ginger jars outside are just beautiful. I am so glad to know that in our northern winters we can still leave them outside. I love this jar so much!!!! Great inspiration! Love the more is more look on all of the tables. I love those large sprays of cherry blossoms! your blog is comforting in these crazy days. thank you. 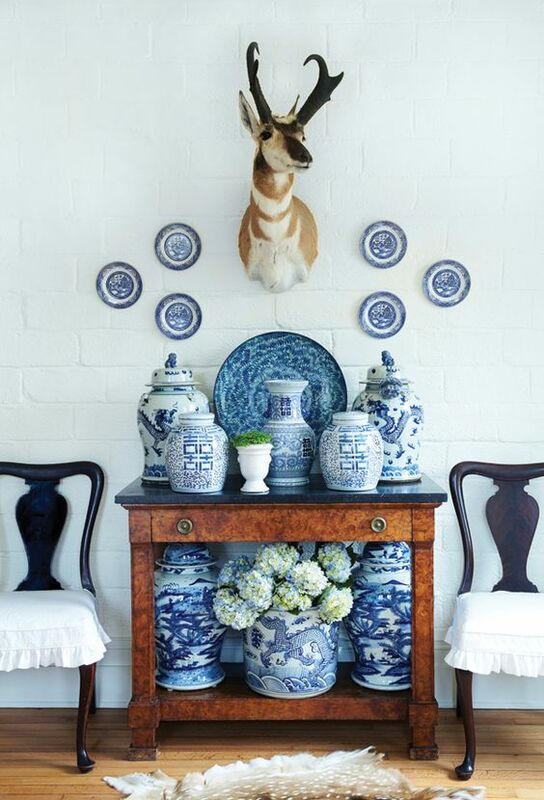 I love the mixture of blue and white ginger jars and vases in a symmetrical display! Love blue and white so much. When we built our house 28 years ago I had some. Now as empty nesters it’s time to redecorate and I need more blue and white! You have the best selection anywhere and I LOVE what I have ordered, but I NEED more!! I love all the Blue and white inspiration you always share with your followers. Enjoy reading your post very much. Thank you 🙏 lovely ideas always. Inspirational! You can never go wrong adding one one more to your collection. 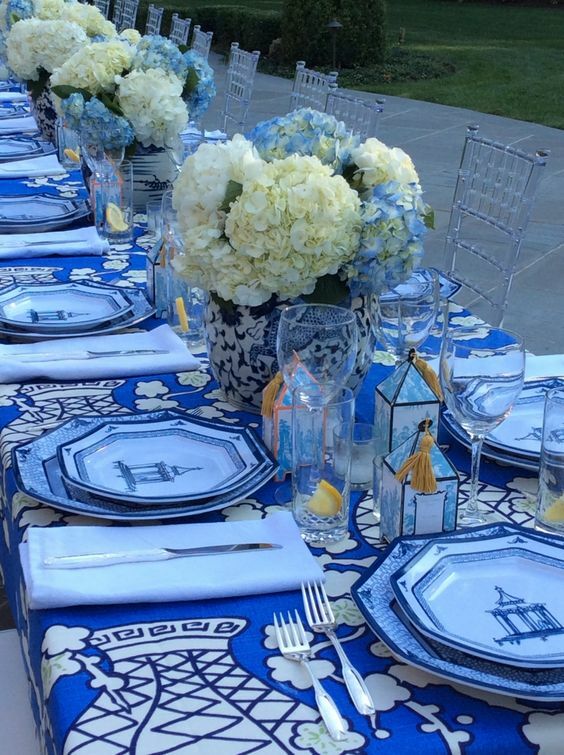 Love seeing the many ways of using blue & white outdoors. Once again inspired! You have convinced me! I need to start adding some ginger jars to my home decor! Ginger jars are classic, indoors or out, in the kitchen or bathroom—love them! 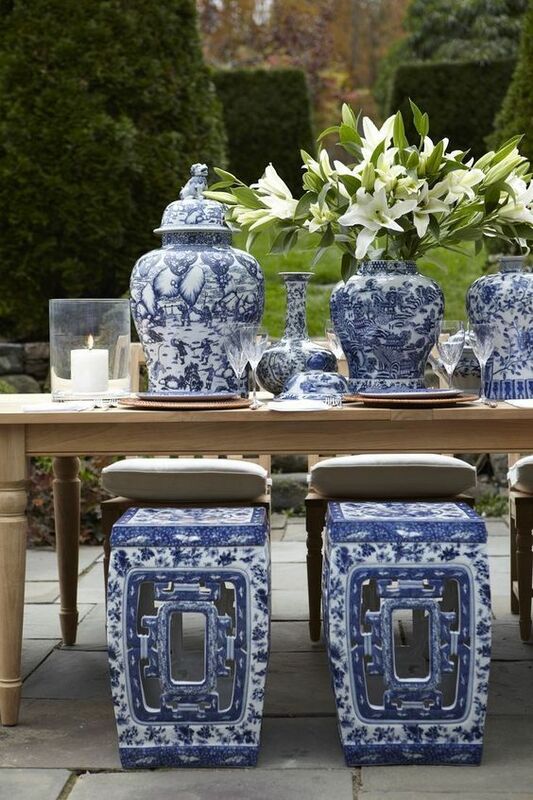 Blue and white ginger jars bring an instant elegance to a room and outdoors. Your pictures are so inspirational! Another fabulous post. I can’t pick a favorite image because I love them all. An naturally, always enjoy seeing pictures of your own home. It’s lovely. I must head to your online shop… I’m searching for something special for my entry table. The ginger jars are beautiful and the giveaway is simply stunning! Thank you for the inspiration every day! I would use them in my sun room where I could still see them even if I’m not in the room. I’m rather new to the blue and white containers, so these pictures give me such great ideas!!! And I’ve learned……you can never have too many ginger jars! I love them in the bath, I love them in the shower, I love them on the table, and in the garden bower. I love them in the kitchen, to give a bit of shine…but most of all i love them, when I can call them mine. Love the juxtaposition of the delicate porcelain with the rugged brick. Mark Sikes can do no wrong. My home is full of blue and white and I can’t get enough of it! Your pictures remind me of how versatile it is as well….looks great in winterscapes and holidays as well as fresh in a spring wedding setting. Thank you for sharing all these great pictures! All the beautiful flowers make me ready for spring. 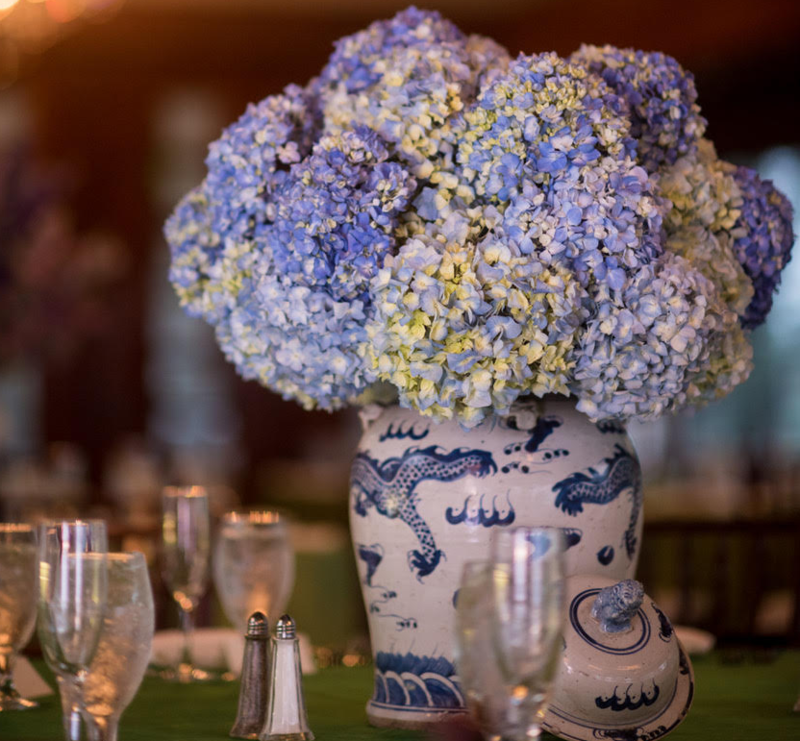 The blue and white is a great compliment for so many different flowers! I want to join the club! I love blue and white! My favorite pieces in my home are my ginger jars I’ve been lucky to find at antique and estate sales. Love blue and white! 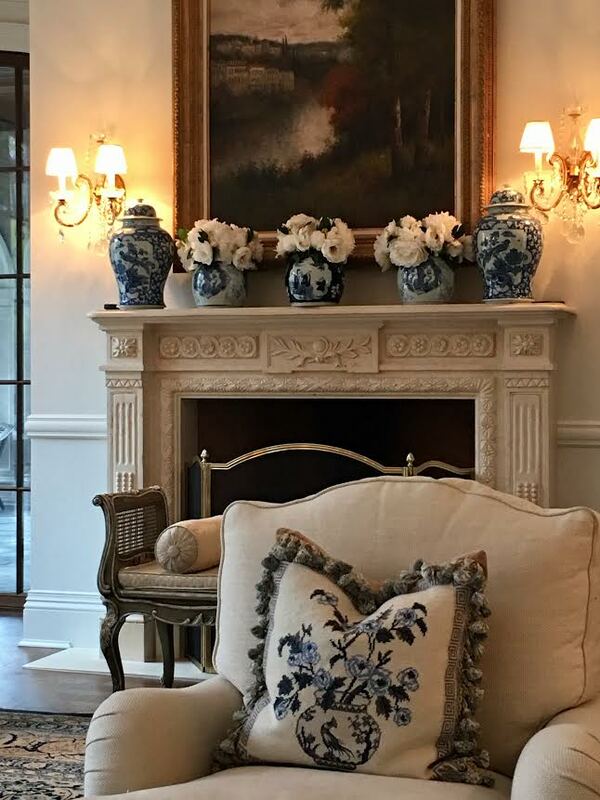 Have it all over my home, but my favorite way to showcase blue and white is to pair it with burgundy furnishings. So rich and elegant. Always makes me happy to see it. Such beautiful and inspirational photos. All the pictures are so gorgeous and the porcelains look amazing! I am a new subscriber. Fun. Pretty ideas. I never tire of seeing how clever people are with how they display this classic design style. 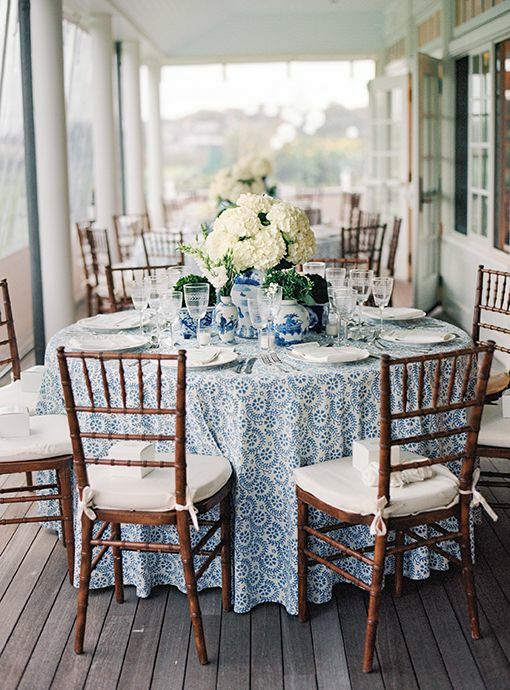 Always loving blue and white tablescape ideas, esp with ginger jars and hydrangeas. I love how you use hydranga’s. I absolutely love them. But I have a question do yours ever wilt?? Mine constantly do. I have researched it and have really not found an answer. If you could share what you do I would really appreciate it!! Thank you!! You always choose the loveliest things to give away. Your taste in decor is timeless. Exquisite. Thank you for an opportunity to win this. Maybe it will be my lucky day on this occasion. Have a great weekend. Thank you for all the beautiful photos are so orderly arranged, and with your notes and tips. I am surprised to find out that the ginger jars can make it outside in freezing temperatures, makes using them as planters viable in Chicago. My son jokingly says he will call China when I die and ask if they want their blue and white back! Enjoy your beautiful blue and white! I need 15 of the give away jars for the new dining hall in my small country church. You game?!?!?! Ms Tina, you always inspire with beautiful settings. 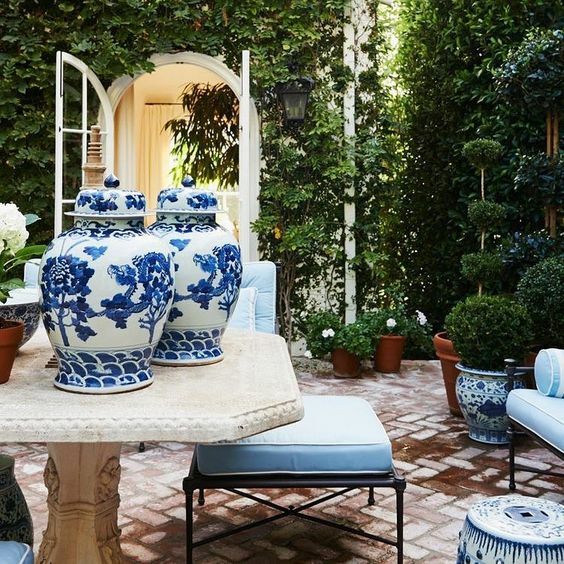 Blue and white porcelains are gorgeous anywhere inside or outside, whether its used for seating, flowers, wall decor, umbrellas, I could go on and on. Thank you so much for sharing these beautiful pieces on your blog. As I said, you inspire us all !! I go to your Blog pictures for my inspiration, then I do a variation of your ideas! I’m forever being complimented on my sense of style (LOL) thank you Tina! Lovely give away. Thanks Tina…….. I love blue and white, have always had it in my home, and have loved it for-ever (40 years)! Love the ginger jars!!! They are gorgeous in any setting! Love love love your website! Such amazing decor!!! Just found your website this weekend and I am so impressed with how beautiful and well-organized it is! I especially love all the pictures that you posted today on the Blue and White Club and I would love to enter your drawing. As long as I can remember, blue has been my favorite color. My entire home is decorated in blue and white, with the exception of my sunroom and family room. I have always loved those ginger jars and vases and have seen them everywhere in recent weeks. I have a few myself. You are right they are making a real comeback in decorating circles. I will be calling to inquire about purchasing some of the items on your site. Thank you so much for sharing your decorating skills and expertise. Our two lab mix dogs would love this for their treats. 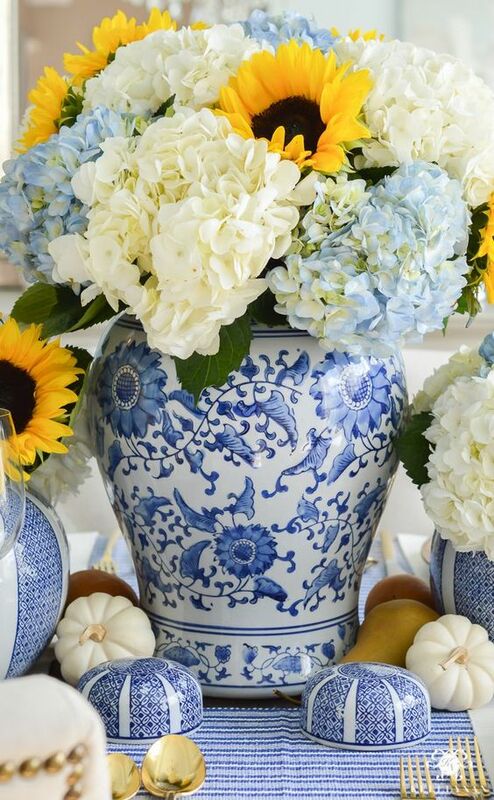 I too love blue and white ginger jars…they mix well with my other blue and white bowls, blue and white pumpkins and even blue and white Martha and George. Pair nicely with white candle holders and a white majestic rooster. 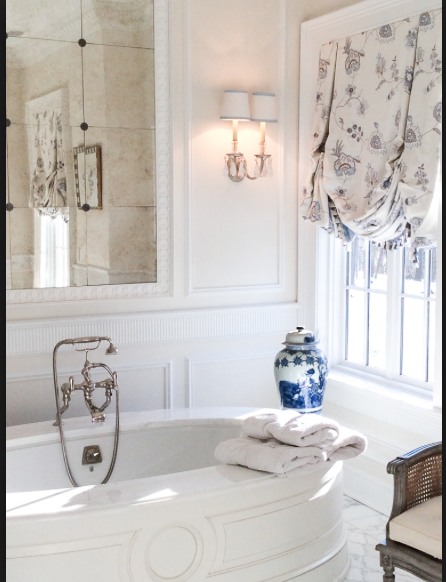 I have been obsessed with blue willow and blue toile for years!! Love everything blue even KY Wildcats! Enjoying all of the pictures. Really pretty ideas. Nothing more classic than blue and white. Any day, every day. Do you have a good resource for your ginger jars? I especially love the bowl with orchids! Love blue and white,just awesome.Thank you. I can’t collect enough blue & white! Now you’ve given me even more ideas of how to use them. Thanks!